Finding a natural solution for a newborn baby with red, dry cheeks will depend on the underlying cause of the rash. Babies can experience any number of minor skin problems and rashes, and often these can be cleared up with natural remedies or may simply clear up on their own. There are many potential causes for your baby's redness, as well as natural solutions. Baby acne is a common, temporary skin condition. 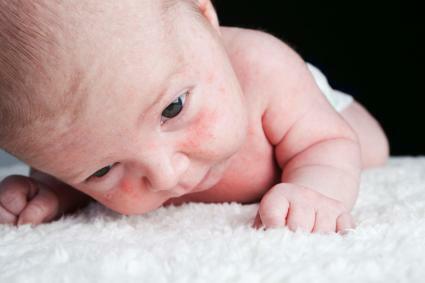 It is defined as tiny, red bumps that develop on a newborn's skin in the first few months. Apply breast milk to your baby's skin with a cotton ball. After it dries, wash it off with warm water. Breast milk moisturizes the skin. It also contains lauric acid, which has antibacterial properties that help fight infection and bacteria. Mix cornstarch with a little water to form a paste. Once a day, apply a thin layer and leave it on for about an hour, then rinse it off with warm water. Cornstarch is a natural drying agent and helps absorb the excess oils. Coconut oil (extra virgin coconut oil) acts as a hydrating agent. It soothes, nourishes and moisturizes the skin. It also contains lauric acid just like breast milk. Dab the coconut oil on a cotton ball and apply a thin layer on the baby acne twice a day. A drooling rash is an irritation caused by excess saliva on a baby's face, mouth, and neck. It is common and can appear as chapped patches of skin with small red bumps. It's safe to apply Vaseline petroleum jelly as needed on your baby's skin. Use it as a moisturizer and skin barrier to protect the baby's skin from irritation from the excessive drooling. Apply coconut oil to the affected areas. It acts as an excellent lubricant to treat the irritation. The lauric acid also helps prevent the chance of infection. Clean the drool immediately from the baby's face and gently dab it dry. This is the best natural way to help treat drooling rash. 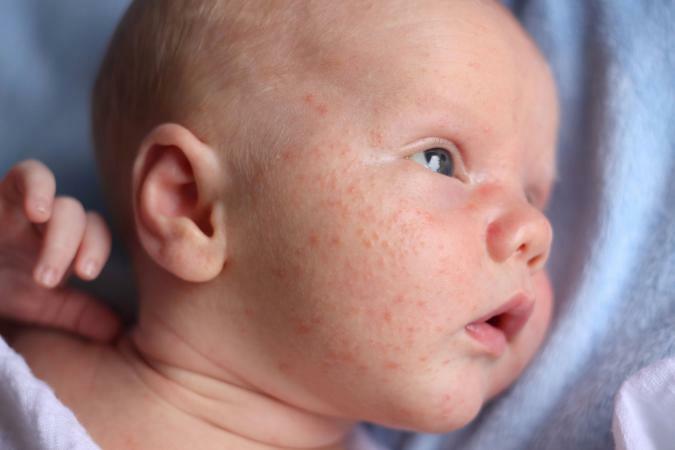 Heat rash, also known as prickly heat, is when the baby develops an itchy, persistent rash which can be caused by temperature changes, fever, excess clothing, or food allergies. Mix baking soda with water and apply it to the affected areas twice a day. You can wash the areas or use as a compress. Another option is to add one cup of baking soda to the baby's bath. Oatmeal has anti-inflammatory, soothing properties. Add one cup of finely ground oatmeal to your baby's bath and bathe baby for 20 minutes twice a day. The relief will be instant. Cool wet washcloths or a lukewarm bath will help give some relief as well. Air dry your baby. Do not rub affected areas with a towel. Erythema toxicum occurs in approximately half of all full-term newborns. This splotchy rash appears anywhere on the baby's body as small yellow or white bumps surrounded by red skin. It may develop two to five days after birth. The cause is unknown. There is no treatment for erythema toxicum, and it typically resolves on its own within 10 days. Milia are harmless, tiny, white or yellow keratin filled cysts that can be found on the baby's face or neck. This is due to dead skin clogging the pores. Typically they disappear on their own within a few weeks, but a few natural remedies can help. Milk can cleanse and remove the impurities in the skin pores. Dab a cotton ball in milk, apply it on the affected areas, let dry for 10 to 15 minutes, and rinse off with cold water. Cloves have the ability to dissolve keratin. Prepare a paste with three to four ground cloves and water. Apply on affected areas but not near the baby's eyes. Let it dry completely, then rinse off with cold water. Aloe vera has excellent anti-inflammatory and antioxidant properties. This can be highly effective in treating milia. Apply aloe vera to affected areas, let dry, and rinse off with cold water. While many skin rashes are benign others may need medical attention. Atopic dermatitis shows up as itchy, red, cracked skin on the cheeks, forehead, scalp, trunk, elbows, and knees. While a doctor may need to prescribe medications such as a topical steroid cream, there are some natural remedies for atopic dermatitis. Coconut oil will keep the skin moisturized. Apply it gently on a regular basis. Make spearmint leaves into a paste by adding water. Apply the paste to the affected areas. This has been found to provide almost instant relief. Mash papaya seeds into a paste and adding water. Apply to the affected areas, which significantly helps with the itching. Symptoms of keratosis pilaris include pinpoint-size red bumps and rough, dry skin. This happens when there is too much keratin and the skin pores become clogged. It is common and harmless. A natural remedy that may help is to use coconut oil that will moisturize the skin. However, it may be necessary for a doctor may recommend a special kerolytic lotion that contains an acid that helps break down the keratin and also moisturizes the skin or get a prescription. Newborn baby care can sometimes be confusing, but most of the time if your newborn has red, dry cheeks it is nothing to worry about. Most often, the natural solution for newborn with red, dry cheeks includes simple, common sense practices handed down for generations. On the other hand, rashes should not be ignored either. If they persist, it's best to discuss concerns with your pediatrician. Most baby rashes are usually common, harmless, and treatable. Using natural remedies have been proven to help relieve and even cure symptoms. But if the rash looks unusual, concerning, persists or gets worse, it is always best to have your baby checked by your pediatrician.